I’ve only been at Whitman for five weeks and I’ve already seen 23 shooting stars, thrown jellyfish at my friends, screamed at an army of raccoons, eaten disgustingly delicious ramen-potato soup, and gone eight consecutive days without showering. Yay for college! Alright, I won’t scare you. I did these things because I went on a Scramble. 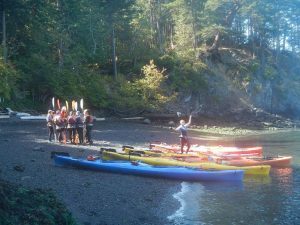 A Scramble is an adventure trip available for incoming first-year students to participate in during the first couple weeks leading up to the beginning of classes. Scramble trips range anywhere from backpacking, climbing, canoeing, to kayaking. 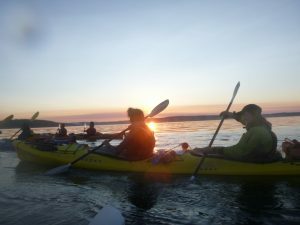 To kick off the start of my freshman year at Whitman, I got to go sea-kayaking around the San Juan Islands with 7 other freshmen and 3 upper-class leaders. We paddled an average of 6 miles per day, camping on different islands each night. We learned how to be frugal with food, water, and supplies, stuffing all of our belongings into the hatches of our kayaks. As you can imagine, we had to be very selective about what we brought! Ironically enough, we packed three tents and never ended up using them at all. Star gazing, baby! Upon deciding to take part in a Scramble, I expected to experience adventure and thrill. What I got was so much more than that. 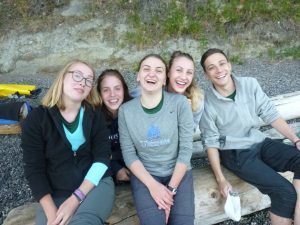 This trip provided the entire basis for my social, comfort, and strength levels of starting at a new school, in a new place, with new people. After these majestic 8 days full of both laughs and cries, I was able to start my first day of school with people whom I am comfortable calling my best friends. There’s something about rationing out (and eventually fighting over) portions of food with the same small group that really makes you bond with each other. Another great contributor to our bonding process was a crazy card game taught to us by Martín, one of our members. I won’t explain the entire game, but let’s just say that once the cards are dealt, all morality gets thrown into the ocean (puns were also a large factor of our trip) and trust is no longer a concept—even when you swear on your life that you trust another player. 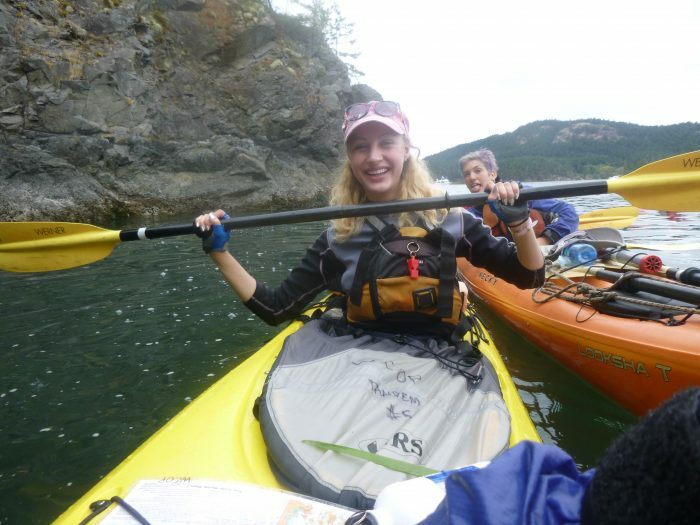 Being one of the three sea-kayaking Scrambles, we naturally had some competition. Our Scramble, called “Joensin’ For Jellies,” was the victorious Scramble this year. Here’s why. 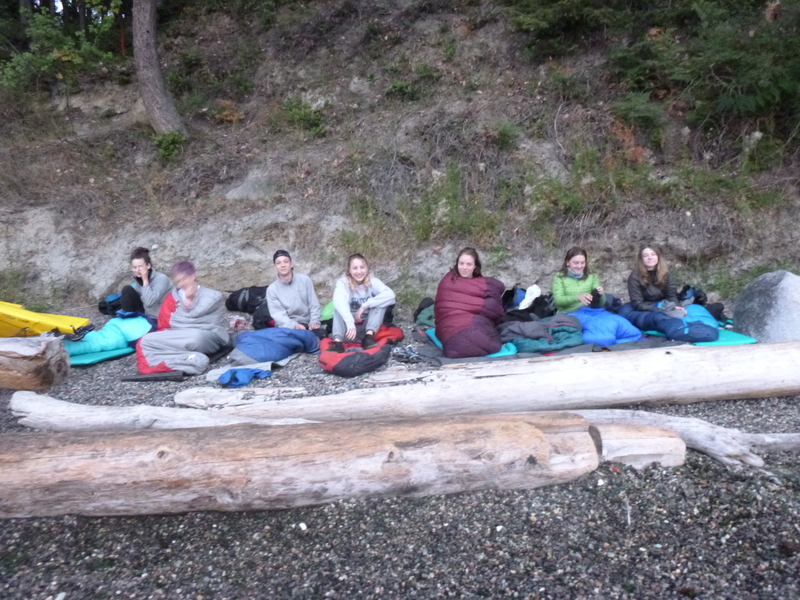 #2: We woke up at 4am in order to make it back to Orcas Island before the other groups. Let’s also note that we had our boats cleaned and packed hours before the other groups showed up. Go Joensin’! #3: On the last night, we woke up at 3am, took all of the boat ties off the vans of the other groups’ trucks and tied them into a big knot with tentacles. We triumphantly (and tiredly) drove away from the campsite, leaving our Jellyfish behind as a reminder of how this year is, without a doubt, the year of our Scramble. It’s Joensin’s year, baby. If I’m being completely honest, I should say that I expected my participation in a Scramble to be forgotten for the most part after a couple days of school starting. Sure, I knew it would come up in conversation occasionally, or maybe I would see one of my group members a couple times a week or even have a “Joensin’ reunion” once or twice a semester. Boy was I wrong. My participation in a Scramble basically become my entire personality identification for the first two weeks of school. Meeting people consisted of “Hi, I’m Sarah. Yes, I did go on a Scramble! Did you?” The freshman class bonded over which trips they went on, and if they didn’t go on one, they joined the conversation, asking about our adventures.And even now, five weeks into the school year, I see at least one of my fellow Scramblers every day with whom I study, talk, eat, or just hang out. Joensin’ reunions are not even planned anymore, they just happen inevitably. We congregate; we gravitate to one another. I guess that’s what happens when you like people so dang much. At Whitman I’ve joined a sorority, become close with my Jewett 4E section mates, and made some close individual friends—but my Joensin’ for Jellies Scramblers will always be my first family at Whitman.